I started this blog in a very different place. It was before I had a husband, babies, a book, multiple things competing for my attention let alone those competing for the attention of the people who read my posts. Instagram had only just been invented and the majority of my internet consumption was through the laptop on which I’m writing this rather than a mobile device. Eight years ago I read my favourite blogs religiously, and whether it’s increasing competition for my time and attention or simply me obediently following the market trend, I find myself scrolling those tiny tiles on Instagram instead, reading recipes posted in comments or stories and getting insights into my favourite foodies through fleeting images rather than words. It’s all about instant gratification and although the majority of Insta-recipes are unlikely to be carefully measured, triple tested, even spell-checked (a tedious pet peeve, but seriously, some big trusted names I’m looking at you) they are immediate and appealing and exactly what we – me included – all seem to want in 2019. This sounds, I’m aware, as if I’m about to announce my exit from the blogging world. I’m not. I love writing too much to jack in the long form content, love looking back at this journey I’ve documented of life and love and family over almost a decade and adore the messages and emails I still get from readers of both this blog and my book. But I’m also aware that I simply don’t have the time or inclination to test and post a recipe every week as I religiously used to do. Every New Year’s Day my husband and I sit down and write out our goals for the year, a mixture of bigger picture – get pregnant, move house, increase income – type intentions and the smaller stuff – practise yoga X times a week, be more mindful, write more recipes. I’ve found that the arrival of a (much anticipated) second child has made me really reflect on where I am in life – ostensibly this happiness feels as good as it’s going to get, but I’m the kind of person for whom sitting still is not an option. And try as I might to live in the moment, I’m always looking on to that next step, planning more. 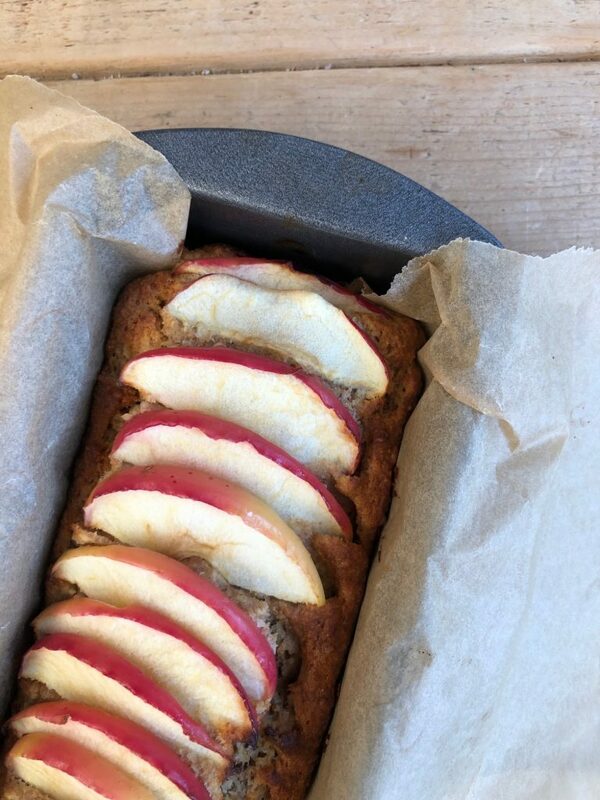 Writing more recipes is definitely on my list whether it’s through this site or via my Instagram accounts @thelittleloafblog and @feedinglittleloaves. The latter, if you don’t already follow, is my family focused feed and perhaps the most appealing to me at this stage in our lives where those littlest loaves rule the roost. The recipe that follows comes from one of my favourite family friendly cookbooks, Real Food For Babies and Toddlers. The author is a mum of three boys so no stranger to filling hungry bellies and her approach to recipe writing is both practical and inspiring. 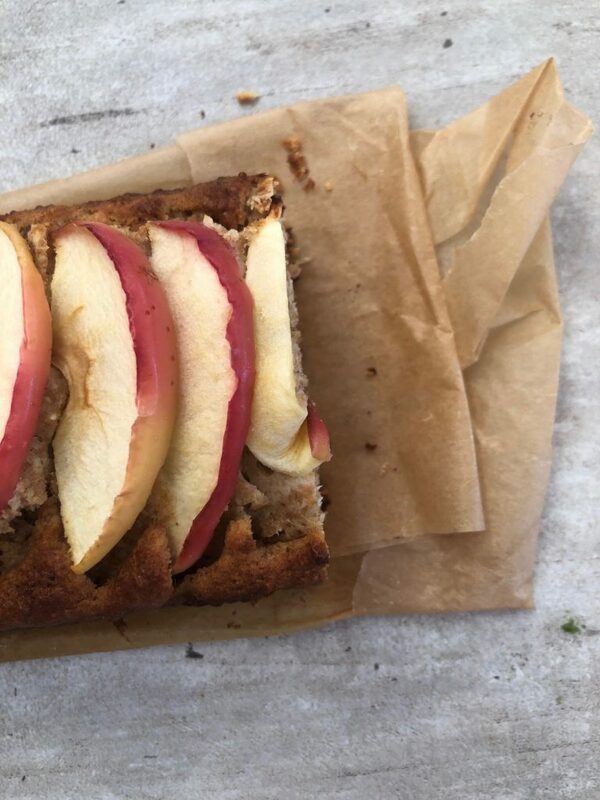 This cake is wholemeal, sweetened only with blitzed up dates and the slices of semi dried apple you see on the top: so healthy you could eat it for breakfast, and yet it still feels like a treat. I’ll be back soon with one of my own recipes, but in the meantime please do pop over to Instagram, tell me what you’re enjoying or not in the recipe world and what you’d love to see more of or next. Happy baking. 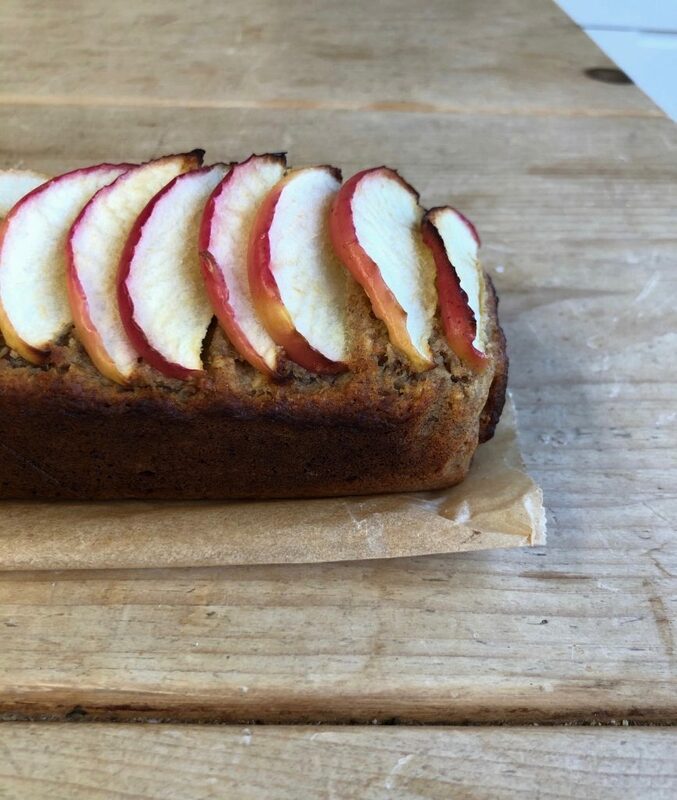 A not too sweet wholemeal loaf cake topped with slices of semi-dried apple. I divided the original recipe between two little loaf tins so we would have one cake to eat and another to freeze, but have written below as it appears in Vanessa's book. Preheat the oven to 180C. Line a 20cm round cake tin with baking parchment. in a medium saucepan, simmer the milk, dates and cardamom over a low heat until the dates have softened and the spice infused. Remove from the heat and blend in a food processor. In a medium bowl, combine the flour, coconut and baking powder. In a separate bowl, beat together the eggs and coconut milk then combine with the other wet ingredients before folding in the dry. Scrape your batter into the prepared tin and top with apple slices. Bake for 40 minutes until risen and golden, then leave to cool in the tin. This cake is delicious warm from the oven but will keep in an airtight container for several days. Recipe from Vanessa Clarkson's Real Food For Babies & Toddlers.